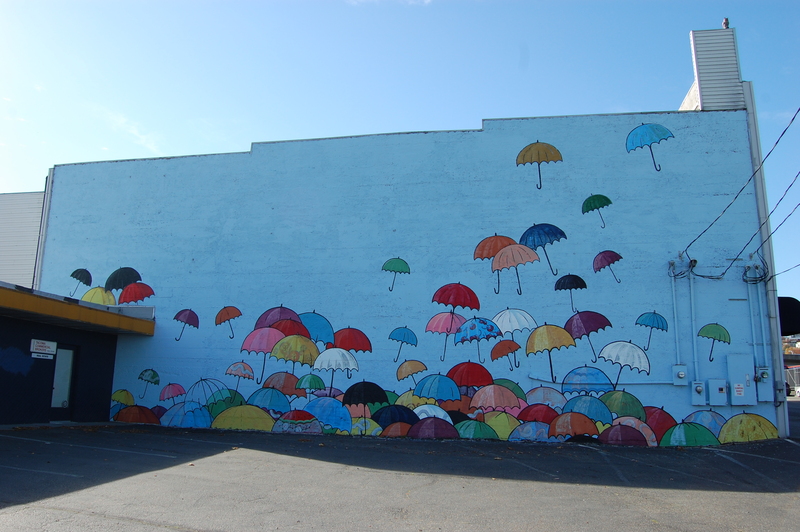 Mural at 220 Puyallup Ave. Lead artist: Chris Sharp. Artist team: Kate Cendejas, Yvette Simone, Janice Lee Warren. In support of the City of Tacoma’s ongoing efforts to combat blight and vandalism, the Tacoma Murals Project would like to hear from community groups interested in collaborating with local artists who will design and implement murals that reflect positive neighborhood themes or messages. The deadline for submissions is May 28, 2013. Each selected community group will receive a funded mural that includes artist supplies and artist compensation, an artist/artist team from a roster provided by the City, technical assistance and general promotion of the project. Mural at 5441 South Sheridan. Lead artists: Kenji Stoll, Chris Jordan. Artist team: David Long, Yvette Simone, Chelsea O’Sullivan, Natalie Oswald. 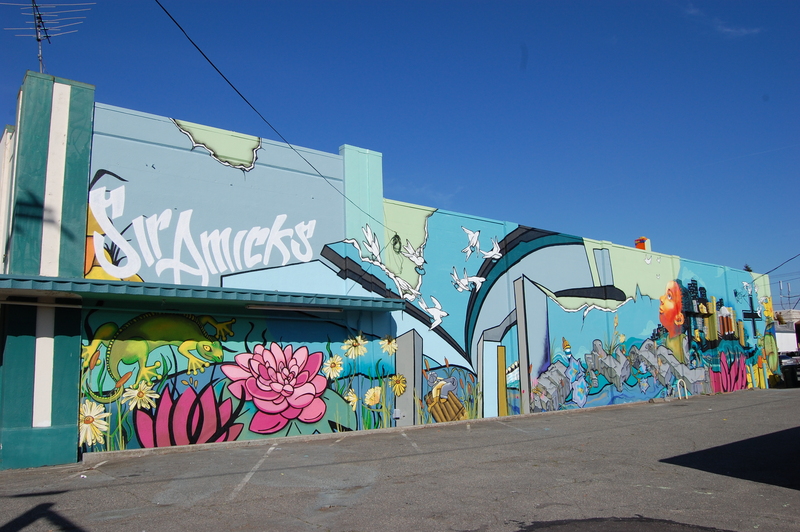 In return, each selected community group would be responsible for contributing in-kind services and materials as required to prepare their mural wall, participating in the selection of an artist/artist team from a City-provided roster, coordinating community meetings and the dedication of their completed mural, and maintaining their mural after completion. Community groups must, with property owner permission, propose specific mural walls. Proposed mural walls must be on commercial or public property and located within Tacoma city limits. Priority will be given to sites located within Community Based Services areas in Tacoma or sites located in areas without a good representation of public art. Full project details, and the application, are available online. For additional information, please contact Naomi Strom-Avila at nstrom-avila@cityoftacoma.org or (253) 591-5191. Thanks to generous support from JPMorgan Chase, the City of Tacoma and the Greater Tacoma Community Foundation are bringing Artspace (a national non-profit artist housing developer) to town to conduct a feasibility study for the development of artist live/work housing in Tacoma. During their time in Tacoma, they will tour potential properties and meet with stakeholders including artists, the business sector, potential funders, and civic leaders. We need the input of artists, arts organizations, arts businesses, funders, etc to help inform this important discussion. You don’t need to be looking to live in a live/work development in order to participate in this conversation. Artist live/work developments can be catalytic to communities providing affordable housing that meet both residential and professional needs of artists. 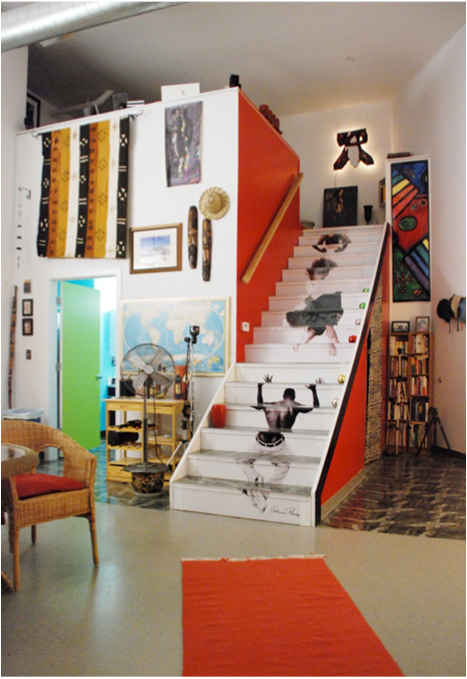 Artist live/work projects are productive creative centers that can become destinations and anchor neighborhoods. With Tacoma’s beautiful historic building stock ripe for adaptive re-use and our thriving arts community, an artist live/work development would be an excellent addition to our arts ecosystem. Feel free to spread the word about this public meeting to people who may be interested. Fun Spaceworks Fundraiser Needs You! Bring your “A” game and retro tennis apparel (optional) to the 4th annual 2013 AIASWW Wii Tennis Tournament. Join Spaceworks staff, friends and supporters for a fun night of Wii Tennis at the cool offices of BLRB in downtown Tacoma. Spaceworks will appreciate your support through your entry fee of $20 for players or $10 for spectators, which includes both food & drink. Please help the City of Tacoma make informed decisions by taking a few minutes to respond to an anonymous survey focused on your current living and working accommodations, as well as any possible desire for new accommodations. The survey can be found at http://www.surveymonkey.com/s/liveworktacoma and should take approximately 5 minutes to complete. We are interested in input from artists of all disciplines from Tacoma and beyond. Please fill it out even if you are not currently looking to change your living/working situation and forward to anyone you feel may be interested. The Tacoma Arts Commission is pleased to announce the selection of Lucas Smiraldo as Tacoma’s 2013-2015 poet laureate. Over the next two years, Smiraldo will participate in and host public poetry readings, workshops and other community events. He will also participate in Art at Work: Tacoma Arts Month each November, and will help produce the 2015 Tacoma Poet Laureate Ceremony to announce the next poet laureate. Lucas Smiraldo performs at the Art Slam. Photo by Jason Ganwich. In conjunction with National Poetry Month, the Tacoma Arts Commission and Tacoma’s current poet laureate, Josie Emmons Turner, will host a poetry reading event at which Smiraldo will officially be awarded the title. The free, public event will be held Tuesday, April 23, from 6 – 7:30 p. m. at the Tacoma Public Library’s main branch (1102 Tacoma Ave. S in downtown Tacoma). Featured poets will include Smiraldo, Emmons Turner, Tammy Robacker, William Kupinse, and Michael Magee. Smiraldo is a Pacific Northwest writer, performing poet and twelve-time produced playwright. His performance credits include opening poet at Def Poetry Jam’s College Tour, featured poet at the National Black Pilot’s Conference, commissioned performances at the Tacoma Art Museum and the Museum of Glass, and featured poet during Seattle’s Hip Hop Awards. He has recently joined forces with master griot and kora player, Foday Musa Suso, to present a unique performance of spoken word, song, and social and political narrative. Fab-5 members Kenji Stoll, Eddie Sumlin, and David Long (from left), with Walida Imarisha, at the Fab-5 community center Fabitat. Photo by Ashley Solus. Walidah Imarisha, a spoken word artist, educator, writer, and innovative voice on issues of youth and justice, will perform with the Fab-5 artistic youth group on Thursday, April 25, at University of Puget Sound. The spoken word performance New Faces, New Voices: The Role of Youth in Educational Justice will take place from 7 p.m. in Schneebeck Concert Hall. Everyone is welcome to this free event. Imarisha will address an educational system that she sees as suffering from a virus that is “much more insidious” in the ways that it damages young people than in the days of overt racism—because prejudices have been driven underground. Thelma Jackson, education consultant to five Washington governors and owner of Foresight Consulting, will open the evening with an introductory talk. This is the final in a series of three public events titled American Voices: Invisibility, Art, and Educational Justice and presented by the Race and Pedagogy Initiative at University of Puget Sound, with support from the Catharine Gould Chism Fund. Walidah Imarisha teaches in Portland State University’s Black Studies Department, Oregon State University’s women’s studies program, and Southern New Hampshire University’s English department. One half of the poetry duo Good Sista/Bad Sista, she uses her art and scholarship to explore identities and to examine methods of control—historic and contemporary. As a lecturer, organizer, and poet, Imarisha has toured the country, regularly challenging people to consider issues that are not often a part of public conversations. One tour involved a talk by Imarisha on “Why are there so few black people in Oregon?” Imarisha told the Women of Color zine that the answer stems from the historical creation of institutions designed for “white, straight” men. She says it is essential for that process to be understood today. Imarisha has facilitated poetry and journalism workshops in community centers, youth detention facilities, and women’s prisons. She was one of the editors of Another World is Possible, the first anthology about the 9/11 tragedy, as well as the first editor of the political hip hop publication AWOL Magazine. She spent six years on the board of the Central Committee for Conscientious Objectors, and helped to found the Human Rights Coalition, a group of prisoners’ families and former prisoners in Pennsylvania. Fab-5, a Tacoma youth organization started in 2000, aims to cultivate a sense of community by providing creative outlets for underserved, urban youth. At the group’s Hilltop center Fabitat, workshops in DJing and music production, creative writing and spoken word, breakdancing, and visual art are held throughout the year. Fab-5 is involved in educational programming with public schools, after-school centers, and juvenile detention facilities. 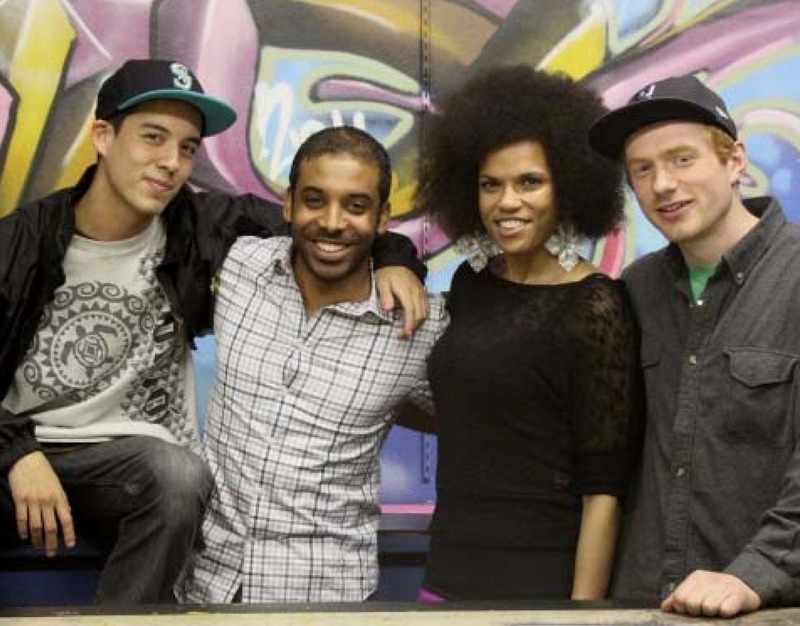 At University of Puget Sound, Fab-5 has a hip hop radio show on the student-run station KUPS. For more information about American Voices: Invisibility, Art, and Educational Justice contact the Race and Pedagogy Initiative at 253.879.2435 or visit www.pugetsound.edu/raceandpedagogy. Join 2011-13 Tacoma Poet Laureate, Josie Emmons Turner on April 19 as she hosts a reading by 14 regional poets on the theme of Gods, Goddesses, and Myth. Participating poets are: Peggy Barnett, Glenna Cook, Julia Cousineau, Caroline Hunter Davis, Maria Gudaitis, Mary Hake, Patricia Kennedy, Patty Kinney, Kay Mullen, Tammy Robacker, Marjorie Rommel, Josie Emmons Turner, Connie Walle, Juniper White, and Carolyne Wright. This reading will be the last formal presentation of poets by Turner in her position as Poet Laureate. 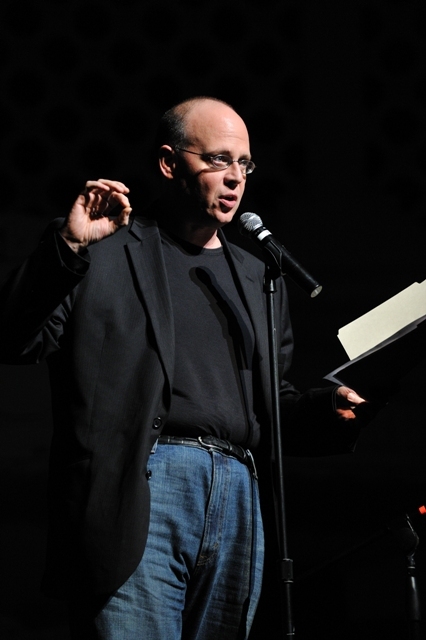 Turner and the incoming 2013-15 Poet Laureate, along with past Poet Laureates Tammy Robacker and William Kupinse will give at reading at the Tacoma Public Library, April 23 at 6 pm. The Gods, Goddesses, and Myth reading is supported by the Tacoma Arts Commission Poet Laureate Program and the Gallery at Tacoma Community College. Peggy Barrett was born in 1945 and grew up in Queens, New York. After receiving a BA in Fine Arts from The Cooper Union, she opened a photography studio in New York in 1968. 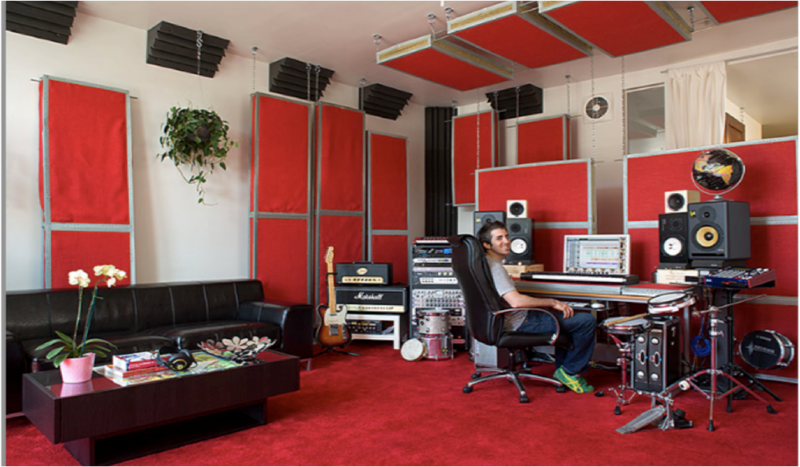 In 2006, she sold her studio and moved to Woodinville. Her book, On Your Left! is a poetic memoir dwelling on the specifics of unending change. Glenna Cook was born in Olympia, Washington, and lived most of her life in Tacoma. After raising her family and retiring from U.S. West Communications, she graduated from Tacoma Community College and University of Puget Sound, which is where she began writing poetry. She has been published in a variety of Northwest journals and reviews. Juila Cousineau always returns to the beautiful city of Tacoma after her travels and has been a resident here most of her life. She is a published short story and children’s writer and has her own humor column in a local paper. Poetry is fast becoming a new passion of hers. Caroline Hunter Davis lives near the Salish Sea where she grew up collecting waves and words. The world first made sense when she listened to myths and she’s been listening and writing ever since. Maria Chong Gudaitis is a Korean-Lithuanian essayist, poet, and designer who lives south of Tacoma. In 2012, Maria published a limited-edition, local Poetry Month anthology and served as a News Tribune reader columnist. Her essays and poetry appear regularly at her blog, www.mairagudaitis.com. Mary Hake is a 2010 graduate of the Creative Writing Program of the University of Washington, Seattle. She currently divides her time between working with students and raising her three children. Patricia Kennedy has published poems in online journals, regional anthologies, and at the Washington State History Museum with the encouragement from the Pot Luck Poets and other friends. She is the co-sponsor of the Gig Harbor Library’s Poetry Series. Patty Kinney’s work has been published by The Sun, hipMama, www.occupypoetry.org and other journals and anthologies. She holds a MFA from Antioch University Los Angeles. Her chapbook How To Talk To Your Schizophrenic Child will be published in 2013. Kay Mullen’s work has appeared in numerous journals and anthologies. She believes the poet’s pallette embraces the reality that all ideas come from the five senses. Poetry includes all colors, shades, shadows and light of the human spirit. Tammy Robacker is former Poet Laureate of Tacoma 2011 and author of The Vicissitudes. She is currently working on her second collection of poetry Villain Song. Marjorie Rommel’s work has appeared in numerous regional journals. She is a member of Auburn’s Striped Water Poets and has provided leadership for the South King County literary community for decades. She received her MFA in poetry from the Rainier Writing Workshop at PLU. Josie Emmons Turner is the 2011-2013 Tacoma Poet Laureate and is a graduate of Pacific Lutheran University’s Rainier Writing Workshop where her mentors included Lola Haskins and Susan Ludvigson. She cherishes the opportunity to have spent two summers of masterclass sessions with Marvin Bell. Turner’s work has been published in a variety of journals. Connie Walle is a life-long Tacoma poet. She is the founder and president of the legendary Puget Sound Poetry Connection. Juniper White is a mom, writer, teaching artist, and letterpress printer who cultivates handwork in Northwest communities. Carolyne Wright has been a contributing editor for the Pushcart Prizes and a senior editor for Lost Horse Press. She is a Seattle native who studied with Elizabeth Bishop, Madeline DeFreees, Richard Hugo, and William Stafford. Ethnic Fest 2013 will be held on July 27 and 28, 2013, in Tacoma’s Wright Park. In preparation for this annual celebration of culture and community, all Pierce County high school students are invited to participate in the Ethnic Fest Poster Contest. Submissions must be received by 4:30 pm on Thursday, May 2, 2013. The first-place winner’s artwork may be used on select Ethnic Fest marketing and promotional materials. It will be displayed in a prominent location at Ethnic Fest. Second- and third-place winners’ artwork will also be displayed at Ethnic Fest. Since 1986, Ethnic Fest has grown to become the largest celebration of culture and community in Tacoma, with an estimated attendance of over 60,000 participants. Voted the best festival of the South Sound, this family-friendly, free festival hosts Kid’s Zones, multiple stages, as well as numerous specialty arts and crafts, food and information vendor booths.